“Racial identity and racism shape white women’s lives: that is the repeated argument of this book,” writes Ruth Frankenberg in In her book, White Women, Race Matters. And, indeed, in many ways this is the framework for this series, the Trouble with White Women. Today, I turn to white women’s role in the second wave of the feminist movement, which spans roughly the early 1960s through the early 1980s. Any discussion of second wave feminism must start with The Feminine Mystique. 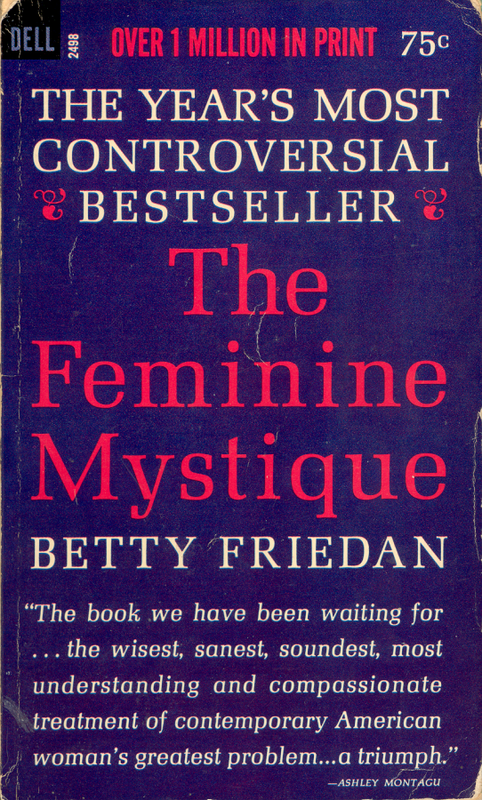 Many people credit Betty Friedan’s 1963 book, The Feminism Mystique, with launching the second wave of the feminist movement. The book, which celebrated its 50th “birthday”, is still lauded with reverential praise. What could have launched a movement and garner praise 50 years later? Friedan’s argument in the book is often boiled down to her famously coined phrase, “the problem that has no name,” which she used to articulate the malaise felt by college-educated, middle- and upper-class, (heterosexually) married white women who were bored with leisure, with the home, with children, with buying products, who wanted more out of life. Friedan concludes her first chapter by stating: “We can no longer ignore that voice within women that says: ‘I want something more than my husband and my children and my house. '” To be sure, this was a radical notion in 1963 for white women who, like my working-class-raised mother for whom “a husband, children and a house” were a fine constellation of aspirations to have. What Friedan defined as the “more” that women wanted were careers. Personally, I’m grateful that someone came along, about the time I was born, and shifted the expectations for what a (white) girl child could do in this world, because that literally changed the trajectory of my life. I’m grateful, too, that my mother was able to see some of the possibilities that feminism opened up for me, if she wasn’t able to see those possibilities for her own life. There’s a serious problem with Friedan’s vision, however. What Friedan didn’t articulate was who, exactly, would do all that work of caring for a home and taking care of children if women were “liberated” from those tasks. Nor did Friedan leave room to consider women who highest aspirations included neither men nor children. She did not discuss who would be called in to take care of the children and maintain the home if more women like herself were freed from their house labor and given equal access with white men to the professions. She did not speak of the needs of women without men, without children, without homes. She ignored the existence of all non-white women and poor white women. She did not tell readers whether it was more fulfilling to be a maid, a babysitter, a factory worker, a clerk, or a prostitute than to be a leisure-class housewife. … When Friedan wrote The Feminine Mystique, more than one-third of all women were in the work force. Although many women longed to be housewives, only women with leisure time and money could actually shape their identities on the model of the feminine mystique. Raising children and doing housework require labor. And, Friedan’s vision of feminism was one that liberated some women (mostly white, upper-middle-class) and contributed to the oppression of other women (mostly poor, working-class, women of color). 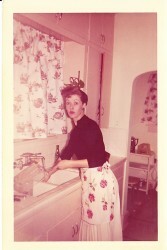 Shirley, my mother, was certainly one of those women who “longed to be a housewife.” When she married my father (her second husband), she achieved that goal, gave up her career and never worked in the paid labor force again. But she imagined something different for me. 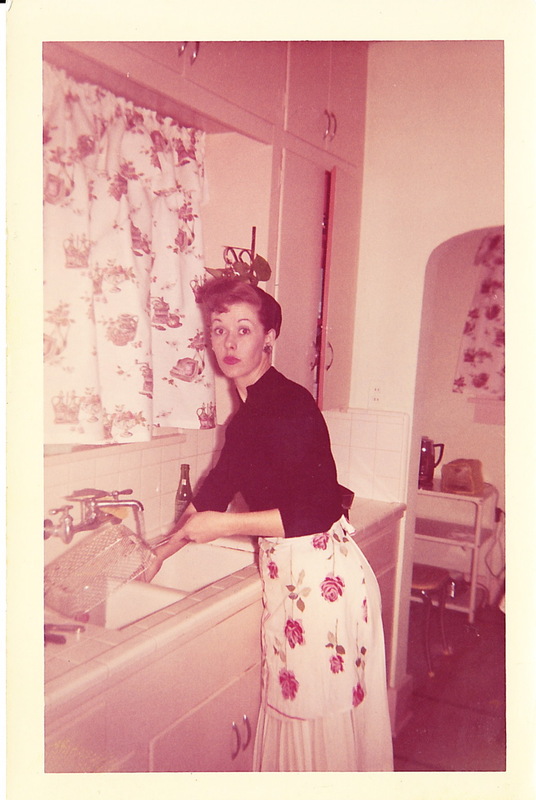 When I would ask her to teach me something having to do with housework – how to do laundry, for example – she’d shoo me away, with a dismissive “you don’t need to know how to do that.” And, for the most part, she resolutely refused to teach me such things. When I would press her on why not, she would answer that: “you can hire someone to do that.” You see, in my mother’s vision of my upper-middle-class, white (heterosexually) married future, she imagined that I would employ a woman of color to do the housework. While certainly not a feminist, my mother’s vision for my life was certainly consistent with Friedan’s vision of feminism. From her early writing, it appears that Friedan never wondered whether or not the plight of college-educated white housewives was an adequate reference point by which to gauge the impact of sexism or sexist oppression on the lives of women in American society. Nor did she move beyond her own life experience to acquire an expanded perspective on the lives of women in the United States. I say this not to discredit her work. It remains a useful discussion of the impact of sexist discrimination on a select group of women. Examined from a different perspective, it can also be seen as a case study of narcissism, insensitivity, sentimentality, and self-indulgence, which reaches its peak when Friedan, in a chapter titled “Progressive Dehumanization,” makes a comparison between the psychological effects of isolation on white housewives and the impact of confinement on the self-concept of prisoners in Nazi concentration camps. It’s this move – placing white women at the center of all women’s experience – that is the real trouble with white feminism. Once you begin to notice this tendency, you can see that it’s a pattern that repeats itself again and again. [I thought] I had the line on everything. And then I found out that I didn’t… I started to see that just because everybody didn’t talk like I did, it didn’t mean they didn’t have anything to say. And the reason maybe they didn’t talk like I did was because I did talk like I did. And so I started to learn about apportioning space and stuff like that. And that was all tied in with learning about the world being made up of more than one kind of person, i.e., white. It was all in the same lesson. What I so appreciate about this analysis is the fact that she explicitly locates white women here, and that she also names the material reality of “the maintenance of all-white neighborhoods,” and “the ‘invisibility’ of Black and Latina domestic workers.” These two seem especially tied to a particular kind of white motherhood that I see here in New York, in which “good white liberal” women have children and then, either want to move out of the city to an all-white suburb or stay in the city where they employ a Black or Latina woman to care for their children. If you want an up-close view of neo-colonialism take a ride on the M101 bus down Lexington Avenue through the Upper East Side and listen to the way that 4-and-5 year old white children speak to the mostly Black and Latina women employed to take care of them. It is clear that these interactions are part of the system of material relationships linked sustained in large measure by the white women in these households. There is excellent research that offers an important corrective to the conventional narrative about the Friedan-inspired second wave of feminism. 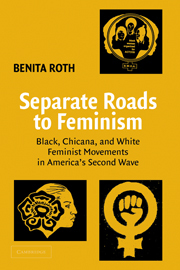 In Benita Roth’s Separate Roads to Feminism: Black, Chicana, and White Feminist Movements in America’s Second Wave, she argues that scholars must move beyond the common presumption that there existed a single “women’s movement” in the late 1960s and 1970s. Instead, she contends that black and Chicana feminist organizations constituted separate feminist movements, not simply different organizations within one movement. The notion that there was one, single “second wave” of the feminist movement leads other scholars to a line of questioning that goes something like: “why did so few Chicanas and Black women join white women’s liberation collectives?” You can see this, for example, in works such as The Trouble Between Us: An Uneasy History of White and Black Women in the Feminist Movement. This line of inquiry situates the feminist activism of women of color as peripheral to the history of the “second wave,” and Roth’s work offers an important corrective to this tendency. The trouble with white feminism, including some scholarship about the second wave, is that it places white women at the center, as the universal example of “all women” when in fact, we are a global minority of women on the planet. Next week, I’ll be back with more #troublewithwhitewomen as I explore the issue of affirmative action.